It can be challenging to eat and speak when you’re missing a tooth. If you’re missing a permanent tooth, it’s time to visit your dentist. Your dentist can install a dental bridge. A dental bridge is used to replace missing teeth. A dental bridge is made up of two major components. The pontic is the replacement tooth or false tooth. The bridge connects this false tooth to the adjoining teeth, helping to keep the replacement tooth in place. The adjoining teeth are referred to as abutment teeth. Dental bridges are very important because they can help you to maintain your smile and face shape. They make chewing food easier and ensure regular speaking capabilities. They also help keep your other natural, permanent teeth from moving or drifting out of place. The traditional bridge is the most popular type of bride. It is made out of porcelain or ceramic fused to metal. Typically dental crowns are place on both teeth on either side of the missing tooth. The replacement tooth is placed between the two abutment teeth. 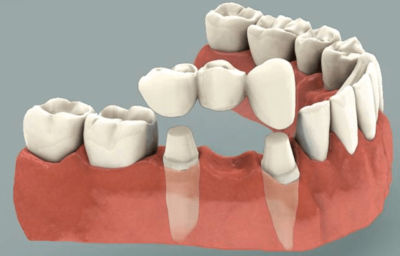 The cantilever bridge is used when there aren’t two available abutment teeth on either side of the missing tooth. One abutment tooth is prepared as necessary and then the pontic is installed. The Maryland bridge is preferred when you want to avoid full crowns on the abutment teeth. The pontic is attached to a bridge made of metal framework. Small wings of metal or porcelain extend from the pontic and are cemented to the two abutment teeth. During your first appointment, your dentist will prepare the abutment teeth by removing some of the enamel. They will take impressions of your teeth so that the crowns and pontic can be made. You may be given a temporary bridge while you wait for your permanent bridge. During the next appointment, your permanent bridge will be installed. Follow up appointments may be needed to ensure the bridge fits properly and comfortably in your mouth. The cost of dental bridges varies depending on the type of bridge you require and the number of bridges you need. Where you live may also determine the coast. Fortunately, most dental insurance companies will cover at least part of the cost. When properly maintained, dental bridges can last several years. It’s important that you take proper care of your dental bridge. It should be cleaned and cared for just like your regular, natural teeth. You should brush twice a day, floss regularly, and make sure you visit your dentist for yearly or bi-yearly check ups and professional cleanings.